March 15, 2017 AAACP LLC. Need to hire a concrete line pump in the Greater Vancouver, Washington area? No Problem. Call Chad Standley (971) 219-5358 to schedule one of the six machines that operate daily in the greater Vancouver, Washington and surrounding Clark County. Interested in Shotcrete? Hire a Shotcrete Pump with an Experienced Operator and Assistant. Call for Pricing. AAA Concrete Pumps stocks only Genuine Putzmeister parts and lubricants. Call Chad Standley (971) 219-5358 to schedule a line pump for your next project. 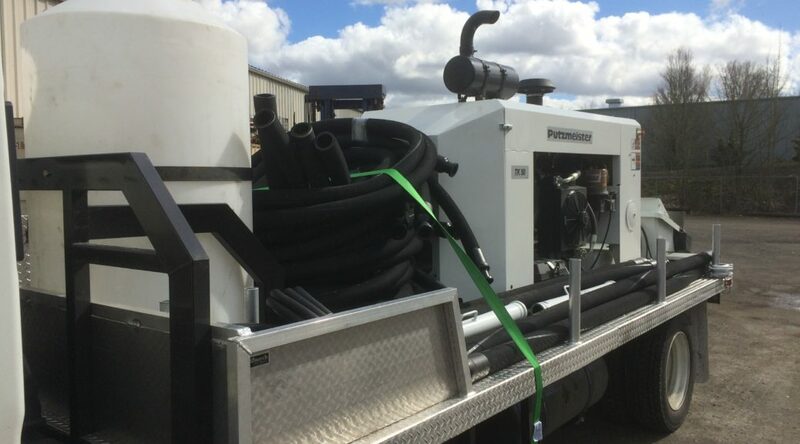 All equipment is self contained, water on-board, and capable of long-distance--high-pressure concrete pumping. Each vehicle carries 2" and 2.5" placement hose. WE HAVE SLICK PIPE AVAILABLE!!! Concrete Line Pumping and Shotcrete Spraying 6 days a week in Portland Metro, Salem, and SW Washington State since 2001. NOTE: Please specify the distance required from curbside, mix design, and concrete supplier (i.e., ready mix or volumetric mixer) when scheduling.